This topic contains 12 replies, has 4 voices, and was last updated by LtHunter 2 months, 3 weeks ago. This topic is to important to leave in the Sleeping Bear Tavern (here= http://mudandblood.net/new/forums/topic/sleeping-bear-tavern/page/29/#post-8713 ) and needs it own thread. 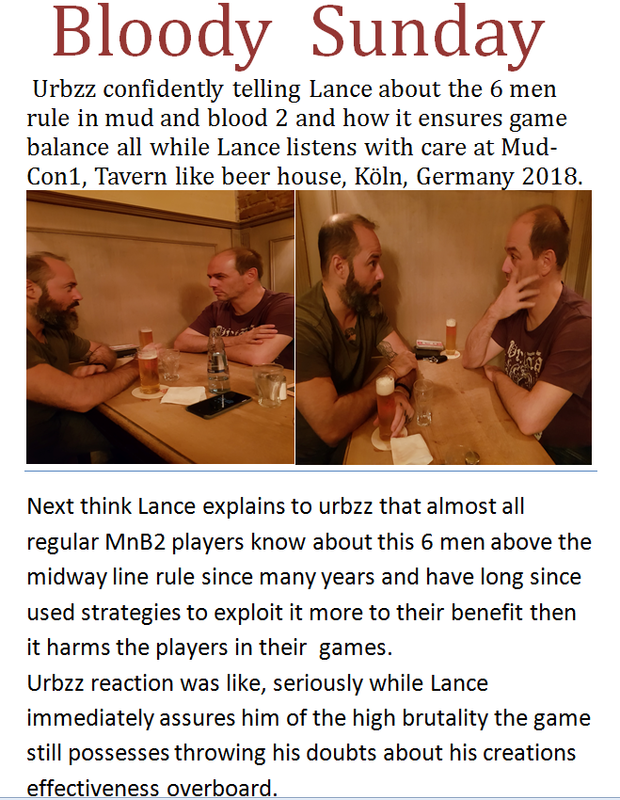 I (Lance) was able to spontaneously meet up with urbzz in September of 2018 in a tavern in Köln, Germany. He was on his way back to Canada and his plane flight was not till the next day so after he and Pepperthumb had already spend a day in the city and went to a few special places he had another day to spare until their flight home. Previously he was in France visiting WW1 and WW2 battle sits and museums including the forest where MnB2 takes place at. He posted a few pictures of that on the Discord. Funnily driving from France to Köln he came almost right by my place but I found out about that after he was already in Köln. After I told him that I had interest in a personal meeting we quickly made out a tavern close to his hotel that was well to our likings. I then booked a hotel of my own close by for that night so that I could enjoy a care free evening with them as well. At 18:00 we met up and immediately got along well. Pepperthumb (urbzz girlfriend) also participated strongly when mostly on more personal matters then urbzz games topics. It all ended at curfew, midnight, when the place closed. Here in this thread anyone may ask me and urbzz (if he participates) more detailed questions about the content of our discussions hence the topic name addition q&a. One big topic highlight here is surely that we had so much fun at the meeting that another meeting with anyone that can somehow participate would be a real cool deal. Since this year is quickly coming to a close I assume that he is talking about 2019. Now through his work I know that he has the capability and time to stop by in central Europe sometime in 2019. He is also a great deal of time in his home somewhere around Ontario, Canada. *Ontario may not be correct but it is what stuck in my head as hometown. So a meeting there or another place of his choice in north America may be easiest to plan. We seen that urbzz (he posted it in the Discord) that he was in Vietnam on vacation to enjoy the country and get first hand live experience to continue his work on recon. Therefore a meeting somewhere far east is also in the range of possibilities. From here people can ask me questions of the meeting or post ideas and make suggestions for a possible Mud-Con2. EDIT: Archived pictures of the meeting. This is a wonderful start!! Thumbs up for the first Mud-Con! Game-wise, what were the dominant topics? We talked about all the games that are still around as well as future projects. Game wise Statecaft was one of the main topics. We drank the local tavern beer called Kölch. A bit of a light beer that is not to hard and can be consumed in mass by experienced beer consumers such as us two. So we both had 10 each to quench the thirst of all the talking we did and boy did we ever talk a lot. A little loaded, but hopefully you can spread a little light, Lance. It’s not often any of us get to have such an intimate/personal convo with the legend himself. It was mostly as seen in the pictures. Two dudes having a few beer while talking half the time of past present and future stuff regarding his games along with some site things. While the other half of the meeting was about personal things. Mostly from myself and Pepperthumb because urbzz work does not allow for public disclosure. As far as Statecraft stuff goes. Nothing specifically new that is not in the Discord channel. However we did talk about making a few alternative settings aside Europe. Like in Japan or Russia or some other place of old and powerful. Still intent on moving to Steam? As far as I know, yes. However he did not spill any details. He is not happy with Kongregate anymore due to his games there getting bad deals and is looking for alternative hosters since doing it like here now with an open to all Flash player makes his games way to easy to steal. More smaller projects would be great. Sadly we did not go to deep into those although we did talk a fair share about OFV and it’s easy to make mechanics. getting all crazy about new ones or making plans for his main titles. We basically talked about all games and projects so if anyone has more questions then just fire away. Remaking MnB with a new engine is an enormous undertaking – is this something that he’s started doing, just as he has an LW remake already underway? What did you feel were the projects that he seemed currently the most fired up about? About the MnB2/3 series. We talked quiet a bit about an MnB2 rework. New mechanics and altering stats and such so that the game would still be fundamentally the same with all that is in it but strategically so different that the old play styles would definitely not be applicable anymore. As far as progress goes. No clue as always. Even there he stuck to his golden rule never to give a deadline or as much as a hint on when anything would come out. Last Winter seams to still be his heart project but my impression was that it is back on the drawing board. Just my impression. Statecraft does seam to have priority right now. But it also seams that in the past few months of his absence here he did not have free time to work on anything game related OR he is doing it the sneaky way again like with MnB3 where I saw a functioning game and not something in raw alpha as it was with Recon. Did he mention at all if he felt he had made a good choice switching to LUA rather than some other coding language or game engine (unreal, unity, etc.)? What we got to see from the new Last Winter was realy cool for me. First person perspective survival in the wilds will be awesome. To bad that only a rough alpha came out so far that is not really playable as far as we could see. His constant jumping from one title to another right when things are heating up in the community does make us a bit awwww but since we know that eventually a game gets born that is way different then anything else out there we will gladly take a bit of waiting into account. Yes Tyrud he is glad to have picked LUA as his follow up game coding language. Seams that the ones that came after Flash (unity, HTML5, ect) are not at all future hardened as some promoted. Sure they have their strengths but LUA can do even more, so he said. I am glad that I decided to do this Q&A style instead of writing a page or more long story of Mud-Con1. This way those that actually want to hear about it can ask that which interests them the most instead of “maybe” reading about it in a very long text that a lot of folks these days do not even bother to touch. Topics where all wildly around. The more time passes the less I can put things in order of event. I am surely not photogenic enough to be the main course of a video where I blabber viewers to the brink of unconsciousness even though the time limit be 5 minutes.
. . . inspirations he has for doing these games . . .
Awww Jesessssss . . .I think I totally forgot to get any intel there. It was a very spontaneous rendezvous and I had not previous intention of doing a thorough interrogation. Order of events. First meat and greet. Small talk cause after all neither had an idea what they got into there. A few beers later the atmosphere was getting bright and we all where getting along well. We started talking about personal stuff like my work, her work and NOT his work. Showed them pictures of my family, house and cats. They did not so we moved to the gaming part. At this point we where already 2 hours in the Tavern. 8 PM. Dinner time so we stopped there and ate. 9 PM. Going deeper into gaming talk. Trying to cover all that has been, is and possibly will be. Lot’s of MnB Site things too and what the future may hold for us. As the evening keeps dwindling along we are having a real blast regardless of my weird US/ German/ something accent and his Canadian out back/ Arcadian something. Before we knew it the place was closing. We gave each other warm goodbye’s, tough hugs and that ended Mud-Con1. Although a great deal of Statecraft was covered it did not go beyond what is already know or in planning. ..what overall features does he want to have in it in order to consider the project finished?.. You should know better then to ask that question. urb still does not give out deadlines or even makes 100% dedications to anything in his games. One day he may say that “its a great idea and will be in for sure” but then nobody ever hears of it again and unless pestered he usually will not pick up the subject either. Not that I say it is a faulty thing to do so mind you. I have not had contact with him since November so I have no up to date information on how things will proceed. If another Mud-Con ever comes to be then someone surely will take video footage.